Dynaplant supplies Callas in large quantities – 52 weeks a year! We are a true plant specialist. Cultivation and sales are perfectly harmonised, which means we can supply what you need, when you need it. You can also benefit from a wide range of plant and enhancement combinations, allowing you to make your offering unique every period. We set a high standard and we’re ambitious. All our processes are structured in such a way that we can guarantee quality, from plants to logistics. Specific processes such as plant selection and our ordering system have been automated to achieve this. We’re always looking to the future, with a focus on customer needs and sustainable business practices. We constantly adapt, as a result of which we can supply our customers now and in the future in a responsible way. Collaboration is in our DNA; we invest a lot in our people, suppliers and customers. The switch was made from a cultivation-driven organisation to demand-led cultivation. Always following sustainable initiatives, such as combined heat and power with a closed water system, with the highest rating for MPS-A and GAP and SQ and will soon be using the geothermal system. Collaboration with the supply chain (upstream): breeders are closely involved in Dynaplant’s production process so that they are also shifting from cultivation-driven to demand-led supply. The nursery was established for the cultivation of Callas and is also engaged in the seasonal cultivation of Clivia. 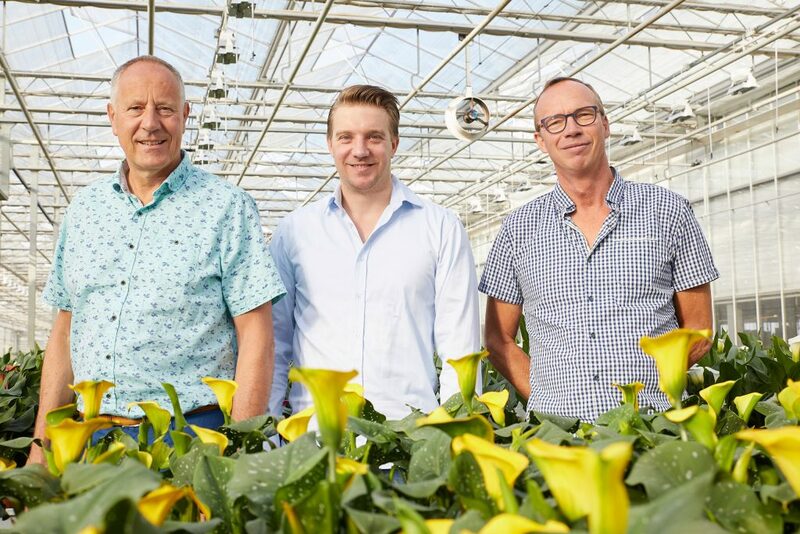 Dynaplant is closely involved in the breeding of Callas and works with its suppliers to improve the range, whereby vase life, number of flowers, colour consistency and decorative value for the consumer are constantly assessed. We’re also happy to help our customers develop their own brand product and/or product line. This means that you’re always recognisable in the plant display. Ask about the possibilities by contacting our sales staff. From cultivation specialists and logistical workers through to sales, everyone works hard every day for our business and for you. Most employees have been working for us for years; together we have accrued a great deal of knowledge to optimise processes. We recognise our responsibility as a business, and make big efforts to find environmentally friendly and socially responsible solutions; we are constantly developing! We follow the MPS guidelines with a completely closed water system; that means that we reuse our water. We have a GroenLabel greenhouse which meets the highest environmental and energy saving standards. Plants need heat to grow; we produce this heat with our own combined heat and power plant. We use this to generate electricity for own use or to feed into the grid. This means we make optimum use of the gas. All residual heat is also used; we use the released residual heat ourselves. With effect from 2017 we’re connected to the geothermal heat supply from TriasWestland. This enables us to use hot water from the soil to heat the greenhouse. This diminishes our reliance on combined heat and power and reduces our carbon emissions.